NetNaija.com is generating over 2 Million page views daily from over 521,000 unique visitors. The website is targeted at entertainment seeking individuals especially in music, comedy, celebrity lifestyle and gossip. Over 6,500 users are subscriber to receive notifications of new published articles on our website. 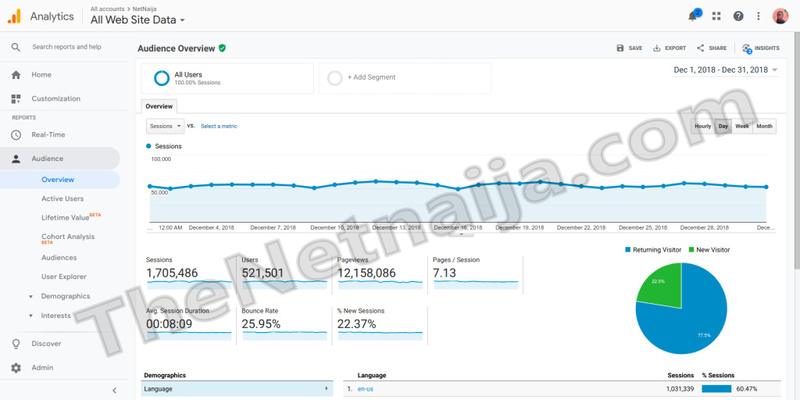 This is a screenshot detailing our traffic for the month of Dec 2018 as provided by Google Analytics - a world renowned analytics service. Visible on all pages, on the sidebar for desktop/tablet visitors and below the content of the page for mobile visitors. Appears before the rectangles. Contact us today at contact@netnaija.com or +2348152377889 (WhatsApp) to grow your products and services.